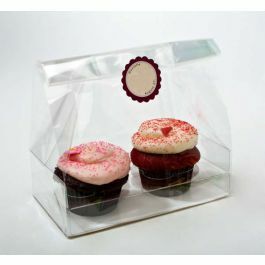 Your customers will see a full view of your cupcakes in this crystal clear packaging. 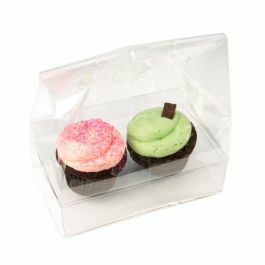 Our CBG8 cupcake bag set is perfect for holding two mini cupcakes. 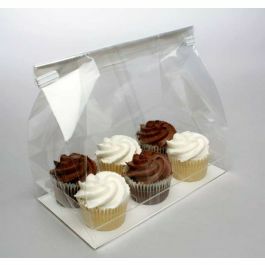 This two-piece set includes a 5" x 2 1/4" x 5" flat bottom gusset bag and a clear plastic tray to keep your cupcakes stable. 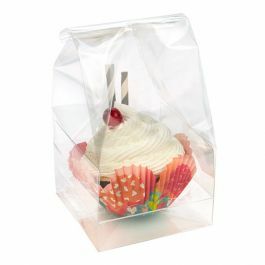 The side gusseted bag allows extra space for frosting, sprinkles, and decorations. To use the insert, fold the long tabs up and place on the sides of the bag to keep gusset from touching contents. Fold the short tabs down and place on the front and back of the bag. 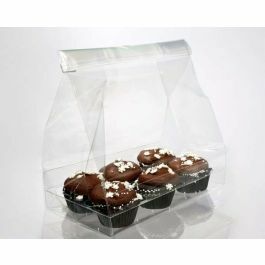 The bag is food safe and made of BOPP material for a high clarity presentation, offering maximum visual appeal for your frosted designs. Heat sealability varies. Testing is recommended prior to heat sealing. Clear stickers are provided for a tamper-proof seal. 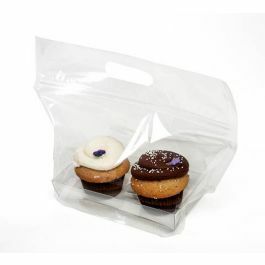 Enhance your brand with a customized print directly on the bag. Custom printing is available. The primary use for CBG8 is for holding a single jumbo cupcake or muffin.